Palladium-mediated multielectron oxidative addition and reductive elimination steps form the basis for numerous cross coupling cycles leading to selective assembly of C–C bonds. Because later first-row metal ions typically exist in oxidation states that vary by only one electron, they are more prone to single electron transfer and unselective radical reactions with organic substrates. These properties have hindered their use as coupling catalysts. We discovered that redox-active aminophenol-derived ligands can be used to bring about palladium-like organometallic oxidative addition and reductive elimination reactions at square planar later first row metal centers. In one application of this strategy, we showed that four coordinate cobalt(III) complexes with redox-active amidophenolate ligands are strong nucleophiles that react with alkyl halides, including primary alkyl chlorides, under gentle conditions to generate stable alkylcobalt(III) complexes. The electrophilic addition reactions are unusual because they formally oxidize the cobalt(III) fragment by two electrons, but there are no changes in cobalt oxidation state because the reactions proceed with single electron oxidation of each amidophenolate ligand. Subsequent treatment of the alkylcobalt(III) complexes with organozinc halides results in reductive coupling to form new C–C bonds, regenerating the four-coordinate cobalt(III) starting materials. Collectively, these reactions form an unusually well defined cycle for cobalt Negishi-like coupling of alkyl halides with organozinc halides. Importantly, this reaction scheme can be used for assembly of aliphatic alkyl–alkyl linkages without forming radical intermediates because, despite the thermodynamic bias for sequential one-electron transfer, the kinetically preferred reactions are concerted two-electron processes. Current efforts are optimizing the C–C reductive elimination reaction for development of highly active redox-active ligand complexes for cross coupling. Oxidative coupling reactions represent an alternative to cross coupling methods for assembly of C–C bonds. Although Earth abundant metal-catalyzed homocoupling of aryl Grignard reagents has been known for over 80 years, its utility in organic synthesis has been limited by the need for stoichiometric chemical oxidants. Recently several base metal-catalyzed aerobic Grignard coupling reactions have been reported, but mechanisms of these reactions are not well understood and the utility of these methods lags behind state of the art palladium and copper oxidase catalysts. We have recently developed new manganese and iron-catalyzed aerobic C–C coupling reactions where the speciation of the catalytic materials is clearly defined in every step. In one example, we prepared low-coordinate manganese(III) complexes with redox-active aminophenol-derived ligands that couple aryl Grignard reagents via a concerted C–C reductive elimination. We subsequently demonstrated that the reduced manganese(III) product of the reaction reacts with dioxygen to regenerate the oxidized manganese(III) starting material. These reactions form a functional, well defined cycle for aerobic coupling of aryl Grignard reagents. Moreover, our studies of each of the reaction steps within the catalytic cycle provide an unprecedented level of detail without compromising catalytic activity. From this work, we have established design principles that we are using to prepare catalysts for other coupling/dehydrogenation reactions that use dioxygen as the terminal oxidant. Accordingly, ongoing experiments are utilizing modified redox-active ligands with varying steric and electronic properties to refine substrate selectivity and to expand the scope of the aerobic coupling reactions. A challenging step in many oxygenase-type redox catalysis cycles is bimetallic cleavage of the dioxygen O–O bond to generate two transition metal oxo complexes. This reaction is also relevant to energy conversion and storage in artificial photosynthetic schemes because the kinetics of dioxygen electroreduction at fuel cell anodes are often poor. Although many transition metal catalysts can homolyze dioxygen, the chemical features that facilitate selective O–O bond cleavage are often not well understood or transferrable to other classes of redox catalysts. We have demonstrated how the ability of redox-active ligands to undergo reversible one-electron transfer can be used to bring about bimetallic oxygen homolysis. A recent study from our laboratory described details of dioxygen homolysis by redox-active ligand oxorhenium(V) anions to generate dioxorhenium(VII) products. Reversible, ligand-centered one-electron redox is a critical feature of the O–O homolysis reaction because the multielectron dioxygen cleavage proceeds by a series of radical Re–O bond-forming steps that generate superoxo and peroxo complex intermediates. Accordingly, incorporation of a redox-active ligand lowers the kinetic barrier to dioxygen activation by allowing the one-electron Re–O bond-forming reactions to occur at the oxorhenium(V) centers without generating high energy oxorhenium(VI) intermediates. This ability to effect metal-centered multielectron dioxygen activation through a series of ligand-centered one-electron steps establishes a new biomimetic strategy for synthetic oxygenase-type redox catalysis and elaborates the principles for design of efficient electroreduction materials for fuel cell applications. Efficient splitting of water into hydrogen and oxygen remains a grand challenge in basic energy science. This is primarily due to the complexity in oxidative assembly of dioxygen. Well-defined catalysts that evolve dioxygen are still rare, and the molecular requirements for oxidative assembly of an O–O bond are not well understood. Recent theoretical studies suggest transition metal oxyl radicals containing unpaired electron density at oxo are critical precursors to O–O bond formation in biological and synthetic water oxidation catalysts. However, oxyl radical complexes are fleeting and/or exceedingly rare, so efforts to rationally utilize them in catalysis have been extremely limited. 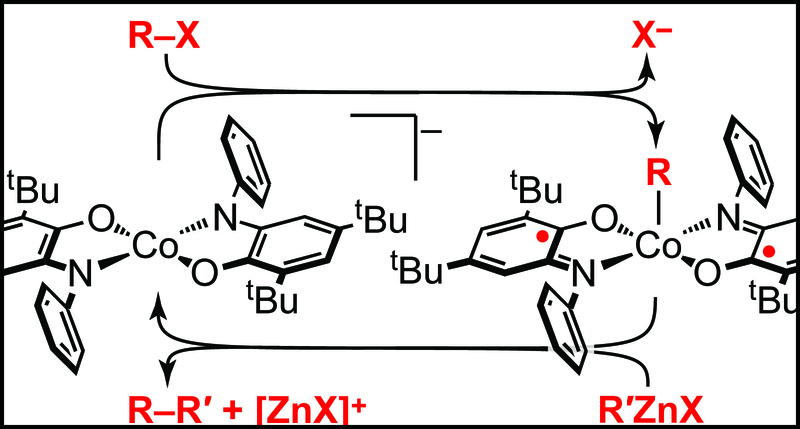 Through the use of redox-active ligands, we have been able to generate well-defined coordination complexes that exhibit oxyl radical reactivity. Stabilizing an unpaired electron in a distal but symmetry-accessible site within the same molecule introduces a low-energy hole into the metal–oxo π-bonding manifold. Intraligand charge delocalization from a closed-shell terminal oxo group to a redox-active ligand facilitates odd-electron oxyl radical-type reactivity. We call these complexes “masked oxyl radicals”. We recently showed that a rhenium masked oxyl reacts with carbon free radicals to make C–O bonds at the oxo ligand. By masking the oxyl radical, the oxo complex undergoes a net two-electron oxo transfer reaction via one-electron steps, without the loss of selectivity typically associated with free radical reactions. Furthermore, we showed that radical character at the oxo ligand leads to kinetic reactivity that is not rationalized by ground-state thermodynamic considerations. We are now applying this methodology to the development of new homogeneous Earth-abundant catalysts and functional materials for O–O bond-forming reactions relevant to artificial photosynthesis.